Those facing criminal charges in Riverhead quickly recognize the significance their cases and the effects the proceedings can have on their lives and those of their families. Consequently, many criminal defendants make the decision early at investigational stages, before arrest to hire a Riverhead criminal defense attorney to defend their constitutional rights. Qualified defense attorneys with working knowledge of the Riverhead courts, its rules, case law, procedures, prosecutors, and police can prove crucial in securing the best possible outcome for their clients. If you have been charged with a crime in the Riverhead area, you will need a skilled Riverhead criminal defense lawyer working diligently on your behalf. Law Office of Glenn Kurtzrock is just the law firm. Call today for a free, initial legal consultation. Law Office of Glenn Kurtzrock can prepare you for the challenges that you face and help you understand the potential consequences of your domestic violence charge. 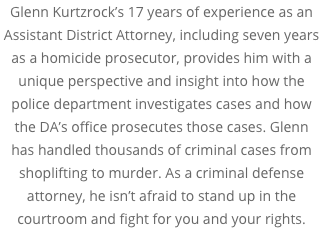 The goal of Law Office of Glenn Kurtzrock is to provide the highest level of service to you and your family. Law Office of Glenn Kurtzrock stays on top of the continuously evolving Riverhead domestic violence laws and is always finding innovative strategies to defend your case aggressively. Hiring an attorney who cares about you and your case, fights to protect your rights, and has a concentration of domestic violence cases will give you the best chance of receiving a favorable outcome. Call Law Office of Glenn Kurtzrock today for proper legal representation in your domestic violence case. Residents from the Riverhead community can depend Law Office of Glenn Kurtzrock to tailor a strategy suited to your domestic violence case. Call (631) 539-1640 today to schedule a free consultation.